As fashion editors, it is part of our job descriptions to stay two (if not five) steps ahead of trends. However, since we see so many fads come and go, we know the importance of developing our signature style and finding those outfits that make us feel our best without fail. At this time of year when we are faced with so much newness, it's important to invest in the trends that you'll love for more than just one season. THE OUTNET is the perfect destination for this shopping philosophy. It stocks previous-season pieces from over 350 designer brands, meaning you can buy investment pieces at unbeatable prices. Our editors Hannah, Emma and Joy each created their failsafe autumn outfit from the standout pieces in the Just In section. One thing is for certain, their finds won't stay in stock for long. There's the perfect Prince of Wales checked blazer from Joseph that's now under £300, and a Preen Line floral midi that will bring some extra joy to your winter wardrobe. Keep scrolling to see which pieces we tried and loved. "Whenever I need cheering up, I automatically reach for bright colours and loud prints—often wearing them together to really add energy!" 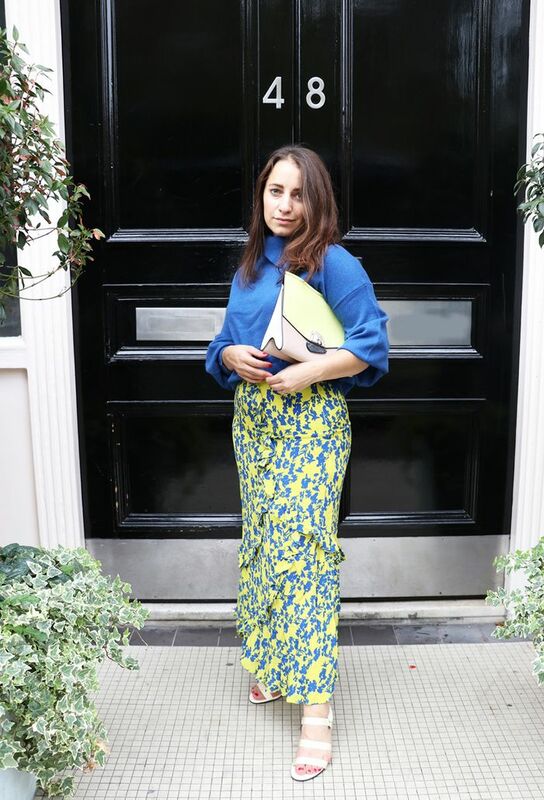 says Who What Wear UK Editorial Director Hannah Almassi about her fail-safe autumn outfit. "I think the old rules on wearing summery colours during the colder months should be thrown out because sunshine yellow and cobalt blue will really stand out in a drab crowd." "If there's one thing I can't get enough of, it's a statement coat," says Acting Assistant Editor Joy Montgomery. "In winter it’s the piece that everyone sees (while your carefully curated outfit hides under knitted layers) when you're out and about, so, in my opinion, it has to pack a punch. This Diane von Furstenberg coat is certainly no shrinking violet, with its high-shine exterior and oversized silhouette, but because the rest of my wardrobe is fairly low-key, it feels like a justified statement. All it needs is a pair of wide-leg jeans and a patterned jumper (zebra is having a moment) to truly sing." "In autumn I live in several variations of this outfit, and it always makes me feel confident," says Deputy Editor Emma Spedding. "A heritage-check blazer is a wardrobe essential for me, and I love the colours in this Joseph single-breasted jacket. These Alexa Chung jeans are a great fit, and the silver button-front fastening makes them a little more interesting than a simple pair of straight-legs. The jumper might look like a basic roll-neck from the front, but behind the cut-out detailing makes it perfect for evenings too."